About eight years after the opening of the German Watch Museum Glashütte, the 300,000th visitor was welcomed at August 2, 2016. The married couple Hofmann received congratulations of the museum director Reinhard Reichel in two respects. Actually, Dieter Hofmann and his wife were on their way to Prague to celebrate their 37th wedding anniversary when they saw the tourist sign at the freeway and decided to visit the German Watch Museum Glashütte. 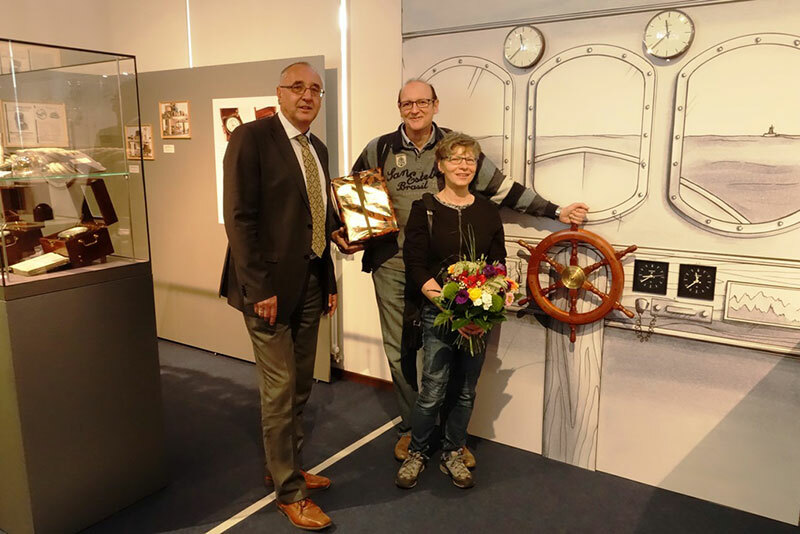 On an individual tour through the permanent exhibition the guests of honor experienced the fascinating history of watchmaking and saw familiar things of Bremen’s environment in the special exhibition which focuses on the marine chronometer production. Beside the book on the history of the museum Mr and Ms Hofmann received a special souvenir: a “Räuchermann” – a traditional smoking figure of the Ore Mountains which represents a watchmaker. It was exclusively made for the German Watch Museum Glashütte. Since its opening in May 2008, the German Watch Museum Glashütte casts a spell over about 35,000 visitors from the entire world. Beside national and international watch enthusiasts the museums welcomes families, school classes and interested tourists as common guests. About 10 percent of the visitors arrive from abroad. Most of them come from Switzerland, Austria, the Czech Republic and China. However, visitors from Haiti, Brazil or Guatemala could already be welcomed as well. The exhibition was visited from guests of more than 110 different nations. The number of international visitors in the German Watch Museum Glashütte increases steadily. To meet the requirements and to customize the exhibition best possible for many visitors, the museum opens up more and more to international visitors. Guided tours through the permanent exhibition and the special exhibition are offered as well tours through the town Glashütte in German, English and French. To meet the increasing demand the museum offers an audio guide system with four different languages - German, English, Czech and Chinese - since 2013. The visitors get to know additional information to the exhibits of the permanent exhibition at 49 stations. The languages are customized annually according to the requirements. Printmaterials of the museum are enhanced regularly: Beside the museum brochures in German, English, Czech, French, Russian and Chinese, all of the in-house publications such as the new accompanying brochure for the current special exhibition “Glashütte on board – 130 Years of Marine Chronometers from Saxony“ are published bilingual.